A view of the Fireside Room we did for The Stoner Mansion in West Hartford, CT. Built in 1928, the quality of detail and scale of this room were awe inspiring. We thought long and hard about how we wanted to handle the decor of the 24' x 30' sheer mass of this room and how to do the architecture justice at the same time creating a space relevant to modern family living. And here's the result. The interplay between rich textures with both modern and ancient silhouettes strike a balance, making the most of their comfort and opulence, but keeping things accessible, usable and interesting. And I can tell you first hand that the room looked even better filled with loved ones, music and merriment. 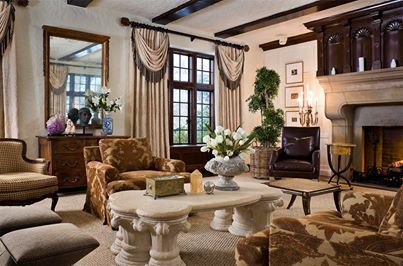 Drapery fabric by Corragio, coffee table by Michael Taylor Designs, Inc., swivel lounge chairs by EJ Victor, neoclassic bench by Julian Chichester, leather chair by Baker Furniture, the mirrors were custom designed for the project by Niermann Weeks. The accessories and Biedermeier side tables were all results of our Indiana Jones’ing adventures through auctions and flea markets around the world - happily adding their Interior Archaeology touch to one of our favorite rooms of all time!